This morning I pulled The Seven of Cups as inspiration for today’s post, and I have to confess that this card is close to my heart in a love/hate sort of way. First I’ll tell you why I love it. The Seven of Cups is about dreams, imagination and the realm of possibility. There is an expansive quality to it and all kinds of options are available when this card shows up. It’s about feeling your way through life and keeping all the creative options open. This card invites you to explore your dreams without editing and restricting them. It asks you to trust and allow whatever it is you discover. For me this has always been a natural and fun process. I love the dreaming phase of any project when I can just let my imagination flow and enjoy the experience. All of this is great and a very necessary part of any creative endeavor. But here’s where the down side can come in, and it’s also a big part of the message of this card. Sometimes it can be so much fun to live in that realm of possibility and imagination that we just don’t want to leave. When this happens we may find ourselves getting caught in a dreamy, ungrounded cycle where nothing is actually happening. All those dreams are beautiful but they never come to be because we’ve chosen to stay in the clouds and haven’t brought them down to earth. Our visions stay in the realm of the imagination and are little more than mirages. Sometimes the down side of this card can show up as scattered energy. False starts and distractions can keep us running in circles because we’re overwhelmed by the expansion. In this case there are too many possibilities, and we don’t know what to choose, so we try to do a little of everything, or we’re afraid to make a choice so we just check out. We tell ourselves that we’re just waiting, but we’re really just choosing to stay stuck. Either way… nothing happens and the time just passes while we sit in the clouds. Both of these scenarios came to mind when I pulled this card, but the message from spirit and the antidote to a Seven of Cups conundrum was right in front of me when I placed the card on my altar to photograph it. The painted stone with Lao Tzu’s wisdom was sitting right there like a neon sign pointing an arrow: “A journey of a thousand miles begins with a single step.” Of course I painted the quote on that rock to help remind me of this on those Seven of Cups kind of days (I love these little synchronicities). The message here is that whether you’re taking a much needed trip to the realm of possibility or you’ve gotten trapped there, you’ve got to come down out of your head and take the first step toward your goal. Often that first step is making a choice. I heard Law of Attraction teacher, Bob Doyle, in an interview recently say that, “Indecision is a form of self torment.” Can you relate? I certainly can, and that down side of the Seven of Cups can often feel exactly like this. It’s a form of struggle, and we’re fighting ourselves. We may even feel like we don’t have a choice simply because we’re looking for a path that won’t rock the boat, make anyone uncomfortable, or be too challenging. What we have to remember is that our power to choose is our greatest creative tool. I know that I have often felt stuck simply because I was afraid of making the “wrong” choice, but I’m learning all the time that it’s better to make a bold choice, gain something from the experience and then choose again than it is to remain in the realm of possibility so long that nothing happens. It’s the trap of escapism, and there are lots of tragic stories through history of wasted talents and gifts. The Seven of Cups is a reminder to actively use our power to choose because when we’re able to receive the gifts from the realm of possibility and then bring those inspirations into tangible form through our choice and actions…. well, that’s what we’re all here to do. That’s being in alignment with your spirit. 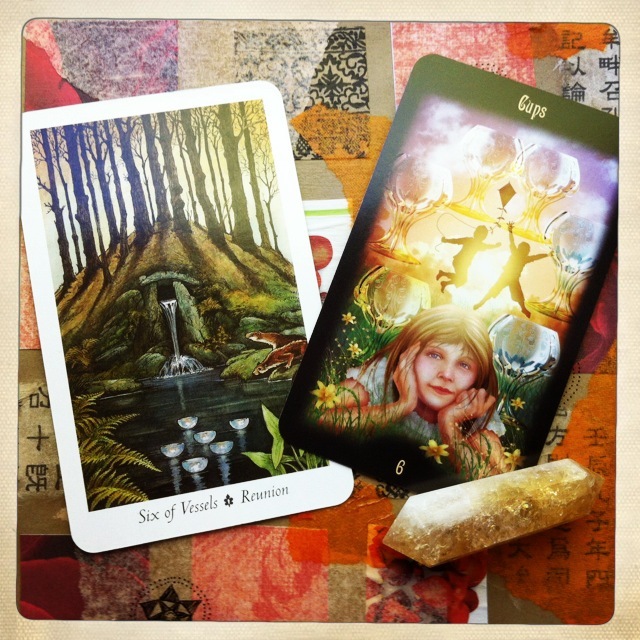 So what is the Seven of Cups saying to you? It could be asking you to expand your realm of possibilities and entertain your imagination. Sometimes we get into ruts that numb us to the beauty of life and deaden our intuitive and creative perceptions. If you’re feeling uninspired, bored or just plain blah your spirit may be calling you to choose to relax and dream a little. Or you might be lost in a whirl of visions always thinking about what you could do or might do without really taking any action. 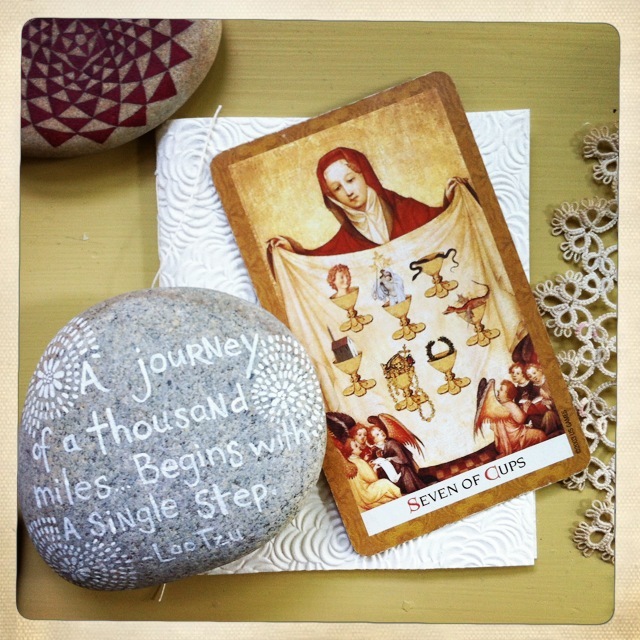 You may feel scattered and have anxieties about looming deadlines or unfulfilled dreams. Either way… make a choice and know that you can always make another choice and another. You are a powerful creative spirit, and you’re never truly stuck. Are you feeling overwhelmed these days? Maybe you’re keeping track of baseball schedules, music lessons, your job, meals, volunteer work, etc… and then there are the errands. You’ve got emails to return, permission slips to sign, and every time you see one of your family members they remind you of something they need you to do. There aren’t enough hours in the day to get it all done and everything feels too important to let go. You drop into bed exhausted and have trouble falling asleep because now your head is filled with the bills you need to pay and the little things you forgot to do…. you’re exhausted and finally fall asleep (or not) knowing that you’ll get up tomorrow and do it all again. It’s exhausting just writing about it, much more, living it. This is really the message of The Six of Cups…. to reconnect with your heart and transform your Inner Adult from a cold task master back into a loving parent. The first step is doing something that feels good to your starved Inner Child. This might mean that you need to take a break and completely change the channel for a few hours or it might mean that you need to approach what you’re already doing with fresh eyes and a lighter step. For example, this weekend my Adult felt that we needed to clean out the barn/garage. It was overdue and had grown into a huge task. As we began the process my partner, Joel, was anxious. He knows that when I go into “high gear” things can get pretty tense, but I had already been reminded during the week that I needed to slow down, pace myself and find the fun in the process. Keeping this in mind…when I found the old hula hoop I took a few minutes to try it out. I let my creative spirit enjoy the treasure hunt aspect of going through old things that I had forgotten about. We talked about ideas for our yard as we worked side by side and played music the whole time. We stopped at regular intervals, got drinks of water, admired our handy work and had snacks. We let our Inner Adults take good care of us while we worked, and we let our Inner Children have some fun. All in all, we got through the whole process without bickering and the task was complete by the end of the weekend. Suddenly a huge weight was lifted.